Sometimes it is hard to be a sports fan. The off-season that has just ended for my favorite team – the Saints – has been one of the worst off-seasons of any team in the history of the league. Strong sanctions cost the team draft picks, coaches and players (maybe – maybe not), allegations of cheating and dirty play, court battles, have turned the darling Saints, who put an exclamation point on the recovery of the Gulf Coast region from Hurricane Katrina with a win in Super Bowl XLIV, into the evil empire of cheats, late dirty hitters and savages. I try to stay objective and allow the truth to surface, but a: we don’t know if it ever really will, and b: I’m not as sure as I used to be that vindication will come, either by retraction or by success in spite of adversity. So instead of dwelling on all of that, and trying to sort out my true feeling about all the scandal that has followed my favorite team around for the past 6 months or so, I choose instead to check out the stories of some of the Saints who profess faith in God and refocus on how life is bigger than we tend to allow ourselves to notice. Here are the stories of 3 members of the Saints team and the genuine faith that drives them to play/coach the game for God and use it as a means to spread His name far and wide. Malcolm Jenkins – Now in his 4th season out of Ohio State, he was a first round draft pick and member of the Super Bowl winning team. Since then, he has become a rising star in the NFL. He was a second team all-pro in 2010 and was a Jim Thorpe award winner in college. It was during his college career that he decided that he would live a life that honored God. You can read this article about him and fellow college teammate James Laurainitis in this article from the Lantern – OSU’s student publication. In it we read that a college teammate leading a Bible study was the way God finally reached Jenkins – and brought him to his life -changing decision. You can learn more about him at the Malcolm Jenkins Foundation page. Steve Spagnuolo – And speaking of life-changing decisions, check out the story of new Defensive Coordinator Steve Spagnuolo. In his story, his first life-changing decision was at the age of 20 when he opted to watch the baseball all-star game with his grandparents instead of hanging out with his friends. On that night, those friends would all be killed in a car accident. He was deeply affected, of course, by this – and it made him doubt the existence of God. 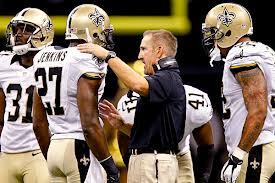 But Christian friends in his life – like current Vikings head-coach Leslie Frazier, helped point Spagnuolo to Jesus. He knows that he is blessed to be a coach in the NFL, a Super Bowl winner (2008 with the New York Giants). Now he begins a new job, as Defensive Coordinator in New Orleans, trying to fix a long time weakness for the Saints, as well as reestablish a good reputation for clean, fair play. Mark Ingram – Ingram is also a college standout looking to succeed in the NFL. He won the Heisman Trophy in 2009 and a National Championship in 2010. He was a 1st round draft pick by the Saints and battled some injury issues in his rookie year. Now he is hoping for a solid sophomore campaign. But Ingram knows football and he knows adversity – both of which can be attributed to his father, Mark Ingram Sr, a Super Bowl winning wideout for the New York Giants, who is currently serving a prison sentence for fraud. You can read his story of faith modeled for him by 3 generations, his choice of Alabama as college team and his foundation of faith that carries him through life as an NFLer and whatever else comes his way. 1- Peer Groups – In know that it is one of the biggest challenges we face to live for God in the midst of our peer group. That is why it is so crucial to decide to take a stand for God no matter what it means to your friends. Easy to say, hard to do. We all like to be liked, and I would say we dislike being made fun of so it is easier to keep it under wraps around others in our peer group. But look at God’s faithfulness shown through a peer’s (another member of the Ohio State football team) reaching out to Jenkins. That is what God used to draw Malcolm to himself. We also see it in the Spagnuolo story with Coach Frazier. God can give us what to say when we take a stand for Him and it could be through you that your friend’s life is changed. Worth it? I think so!